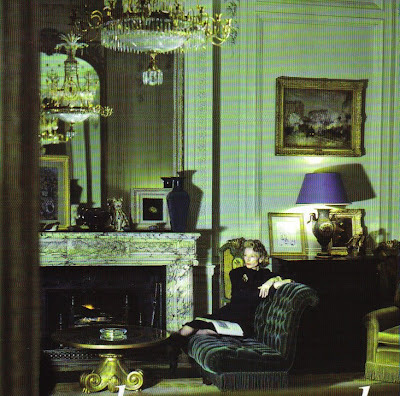 The Peak of Chic®: Fireplaces...in June? It might seem crazy to be thinking about fireplaces and mantels in June, but I am. One of my condo's previous owners installed a faux fireplace, and words can't describe how ugly it is. It's cheaply built and cheap looking, but for various reasons I chose not to remove it. And because I have a long living room, it's actually nice to have a fireplace, even if it is faux, to help break up the expansive wall. A very creative friend of mine is going to help me tart the thing up, and when all is said and done, I don't think anyone will ever guess that it was once pretty hideous. Unless of course you are reading this post and then you will know the truth! A Chinoiserie chimneypiece designed by Henry Holland that was originally created for the Chinese Drawing Room at Carlton House. It is now installed at Buckingham Palace. This, to me, is perfection. Edward James' bedroom at Monkton. 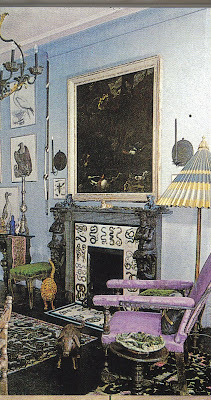 The fireplace is not the only fabulous thing about this room. This black scagliola mantel, designed by Gil Schafer, is one of my favorite mantels ever. And it's so simple too. Why not take out something you don't like or respect that cant give back in a real way and replace it with the purchase of a beautiful large console table? You will have something beautiful, it can take a display of loved objects just like a mantel and one can build a room around it in exactly the same way. 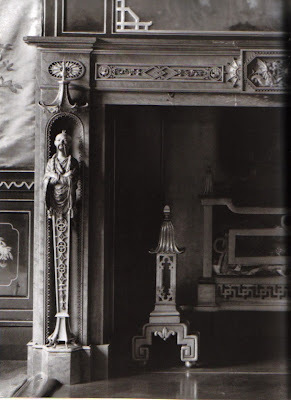 The Chinoiserie chimneypiece is so wonderful. I might have to borrow that photo for Chinoiserie Chic. Are you going to tell us what you and your friend's ideas are for yours? We'd love to know. 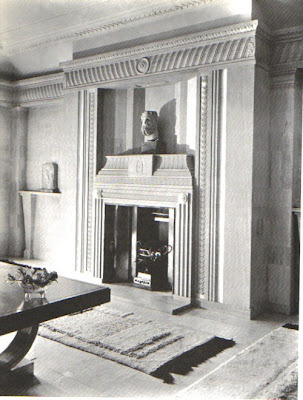 I am sure you and your creative friend have probably already thought of this, but once I had an awful looking fireplace a with really ugly marble surround (not pretty marble, ugly marble - don't even know what it was!). I had the marble faux painted by a good decorative artist in Dallas, making it look like a totally different stone. It changed the look drastically - still not my dream, but much better. Good luck! Surround the offender with a sparkling bolection molding made of glass sections, à la Ruby Ross Wood. Or top it with a chinoiserie-style overmantel mirror or some-such to give it architectural pizzazz. Or top it with a dead-plain triangular mirror whose sides are precisely the same length as the mantel for a more-modern effect—just get the mirror cut, lightly bevelled, and framed in very plain, painted wood (think David Hicks). I look forward to reading about your solution. I have a similar ugly thing in my home. Ugly brick. I painted it white 25 years ago and thought it would go away in a white room. It was in the family room, part of the kitchen. I turned the room, with the fireplace, into my dining room and that worked. But now, with empty nest, am thinking I want the dining room to also function as a library and want it red. What to do about the fireplace haunts me. I will let your genius show the way. Jennifer I bet you could look as soigné as Millicent Rogers! She is one of my style icons! Go to an architectural salvage shop and buy an wonderful old vintage mantle with tons of detailing. Very interesting and thoughtful post. Perhaps you can reface the fireplace, adding a new front to it, a new mantel. In the meantime, why not be like Millicent Rogers and pose so elegantly in front of your fireplace, dramatic and dramatically lit. It's a good start. Gosh, everybody has such great ideas... now I don't know what to do!! I guess that's a good problem to have. Thanks! Currently stalking Gil Shafer's site like the obsessed. That would be a great model to follow. At the very least, the image on your inspiration board would be so chic. Gil Shafer's mantel is hands down the most beautiful that I have seen! Mrs. Blandings- I too am obsessed with his work and when I see him at design functions I am always at a loss for words- as I just adore his work so much. If I was to build a house- he would be my architect. I better get back to work here as that is going to be a pretty penny! I'd love to see an image of the offender. Mine was this 60s brick monster & it toook a lot of sweat equity but thanks to a bit of demolishing and covering...no one ever knew. Man I wish there was digital photography back then. This thing was called the fugly monolith. First of all- I love Millicent Rogers- but who doesn't? Saw her house in New Mex. Secondly- I LOVE "tarted up" my decorative painter used that phrase a LOT.Thanks for the memory. An overmantle mirror as AAL suggests is a wonderful idea. 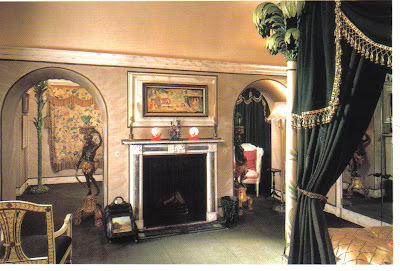 I really like your selections here - a mantle is to a fireplace as a frame is to a picture - so important! The Chinoiserie is quite my favorite. I hope you'll post pictures of what you do to your fireplace! Oh my, I am so with you on the Holland Chinoiserie fireplace. It truly is unlike anything else -- no wonder was snapped up in a royal minute. Whatever you do I am sure it will be fantastic and please post before and after when ready. 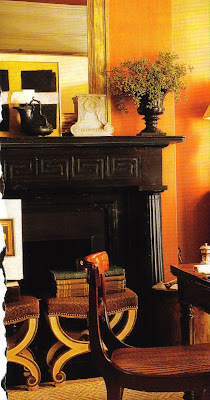 My favourite mantel in the post is Shafer's but of course every room has a different style/purpose. Curious about yours. I was thinking about your friend "tarting" up your mantel. Decoratorssupply.com makes a number of "Chinoiserie" style plaster ornaments to apply to your mantel. Type in "oriental" in their search engine. Also Bendixarchitectural.com makes a nicely detailed half round faux bamboo in two sizes. Their #1381 and #135. This might be inspiration for your project. Edward- This is great information. I could spend hours on those sites! Thank you! Without seeing the actual monster, hard to prescribe, but I have a Z-brick chimney that I'm going to chip the Z-brick off(along with the styrofoam faux beam) and then cement and tile it. Cement because it is a working chimney and needs to be firesafe. Couldn't you get some hand panted tiles, or for a thirties glam look get mirrors cut to fit the facing and cover the thing if it's really bad. I love the Rose Cummings room, and the lampshade/umbrella is perfect.